﻿ How correctly use All In One SEO Pack plugin in WordPress and get SEO benefits? All In One SEO Pack is one of the most widely used WordPress Plugin for SEO. Its popularity can be judged by the fact that it is downloaded more than 3 million times till now. It is the Best SEO Plugin for WordPress and in this Guide I will explain all its features which you can use to do WordPress SEO. By default WordPress websites do not have features to add Meta Tags directly in pages and post. So with this plugin you can do these things. 1. Add Title to Page/Post. 2. Add Meta Description to Page/Post. 3. Make them NOINDEX which means telling Search Engines to not to index the given page or post. It also provides lot of other SEO features like generating sitemap and robots.txt, which you otherwise have to do it manually using FTP. In the sections below I will discuss all its features which will help you to do WordPress SEO properly in your site. You can download this from here. Then activate it from the dashboard. Also see How to Install Plugins to learn about installing plugins in WordPress. 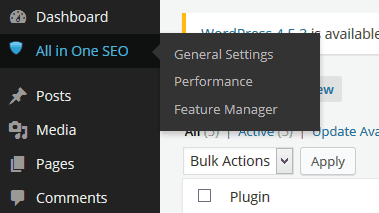 You need to configure it so click All in One SEO > General Settings link in your WordPress dashboard. 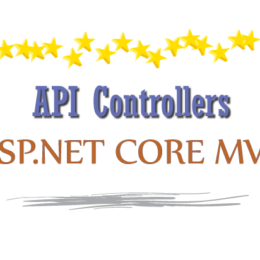 You will find various options based on Canonical, pagination and protocols. 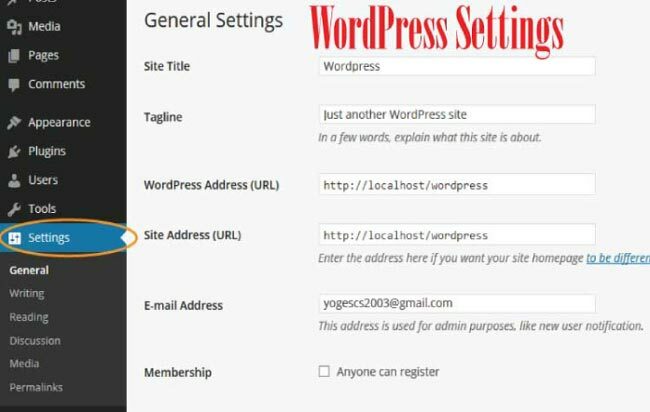 The Plugin will check all the necessary options by default, (which are needed in all general WordPress website), so you don’t have to do anything else in this section. You can also check more about these things by clicking the question mark icon before each of them. It basically tells search engines that a given URL is the same like the other mentioned URL. This prevents Search Engines to mark the URL for duplicate content and hence is a good thing for your WordPress SEO. 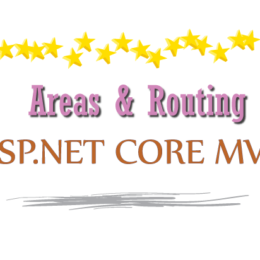 Home Page Settings – From this section you can specify the home page Title and Description. Keep the Title length 60 chars and Description length 160 chars max. This is because Search Engines truncate the remaining characters when showing them in SERPS. It is important for SEO that you should put your Site Main Keyword in this Title. Description is the Meta which shows up in SERPS just under the Title. It is only for display purpose and does not add to an SEO benefit. But since it shows up in SERPS, people can read it to know what exactly the page contains, and therefore it becomes important to have it. 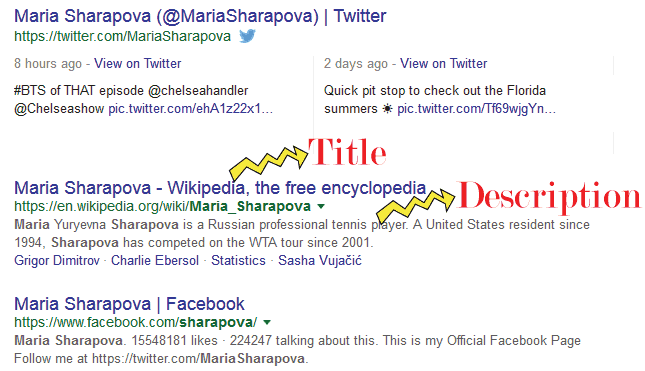 In the given picture I have marked the Title and Description shown in Google SERPS when searching for Maria Sharapova. 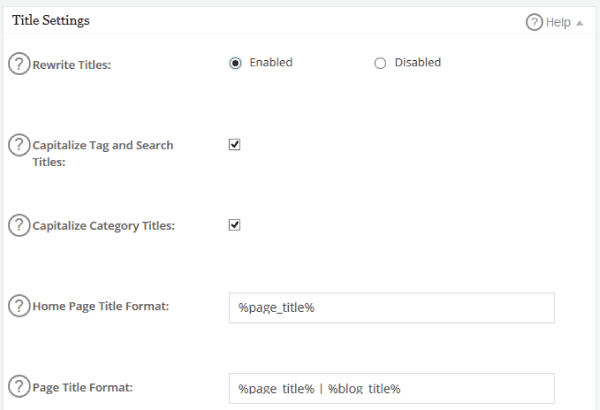 Title Settings – From here you can set the format of title for home page, other pages and post, categories, archive, search, etc. I recommend leaving them as it is for optimal results. Custom Post Type Settings – If you are using some plugin which generates specific type of post, pages, form, etc then you can set their titles from here. For example WooCommerce Plugin generates Custom Post types like Product pages, Account page, cart page, checkout page, etc. So we can set their Titles from here. You can have a look on How to Install WooCommerce and make Website Ecommerce Ready which explains about WooCommerce Plugin in details. 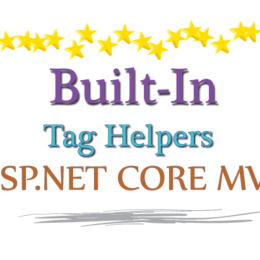 Display Settings – Let’s you to select which screens display the Title, Meta Keywords and Meta Description. I recommend leaving them to their default state. It can be done very easily from this plugin. When Google asks you to verify the ownership of your site then click on the Alternate methods tab. Next select the HTML tag radio button. Copy what is inside of content=”” and past it in the text box. All in One SEO Pack automatically adds the Google Webmaster Code in your website so you don’t have to do the manual addition of this code. 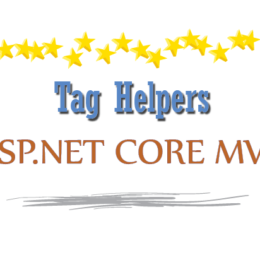 This saves time and prevents errors when pasting the code in a wrong area of the website. Google Settings – Enter your Google Plus profile’s URL, if you have it. You can opt for displaying Search Box in SERPS against your website. There are also some other settings listed in this section but I do not consider them important so just leave them as they are. You can also put your Google Analytics ID from here and this plugin will automatically add the analytics code in your website. Do you have problems in understanding SEO? If yes then there is a solution, check SEO Terms tutorial which is specially made for beginners like you to understand SEO completely. All in One SEO Pack also let’s you add Google Analytics Tracking Code easily in your WordPress website. After adding your Website in Google Analytics you will get a tracking code. 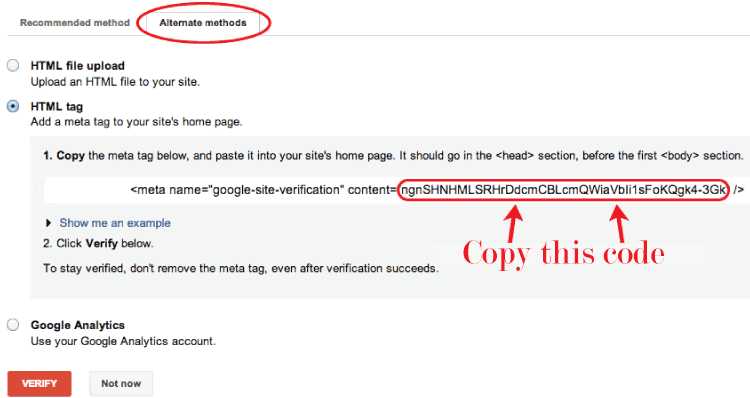 Copy the Tracking ID and paste it in the Google Analytics ID field. The below picture marks this Google Analytics ID. Google Analytics is a free tool to tracks your Website Stats like number of people visiting your website, their country of origin, how they come to your website – organic, referral, social, direct, etc. It is a complete tool which you should have for your website. Check out the Google Analytics tutorial which explains how to use this tool. 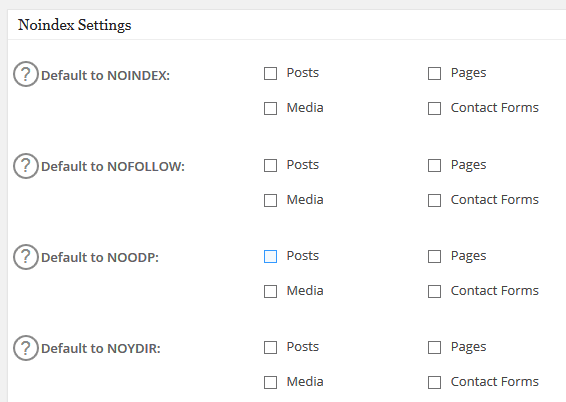 Noindex Settings – It let you to tell Search Engines not to index a given page or post. Use this setting carefully as this prevents a checked option to show in search result. For example if you checked Use noindex for Categories, then all category pages will not be indexed by search engines and therefore will not show up on SERPS. I would recommend you allow Search Engines to index everything in your website, therefore keep everything unchecked here. Advanced Settings – These are the settings used by SEO experts. For beginner purpose just leave them as it is. Keyword Settings – From this area you can put Meta Keywords in different areas of your website. Search Engines do not use keywords anymore so keep it disabled. 1. 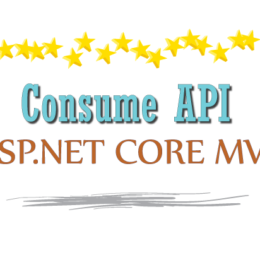 URL but not exceed the length above 5 words. 2. Title but not exceed the length above 60 characters. Performance Settings – You can fine tune the performance of your website from this area located at All in One SEO > Performance. Unless not extremely urgent I advice not to touch it. Sitemap is basically a XML file that Search Engines crawl for finding out the URL of your website. 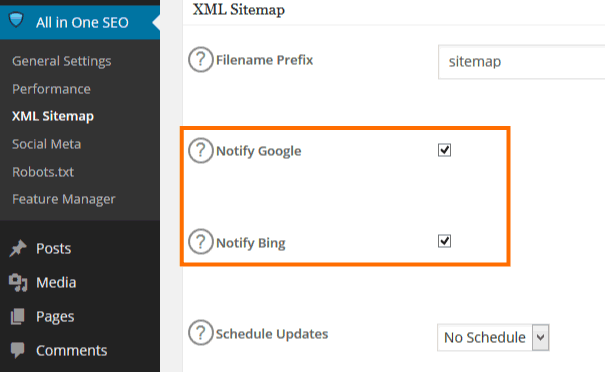 The sitemap also tells the last update time of a URL, its priority (how important it is) and change frequency (how often it is changed). 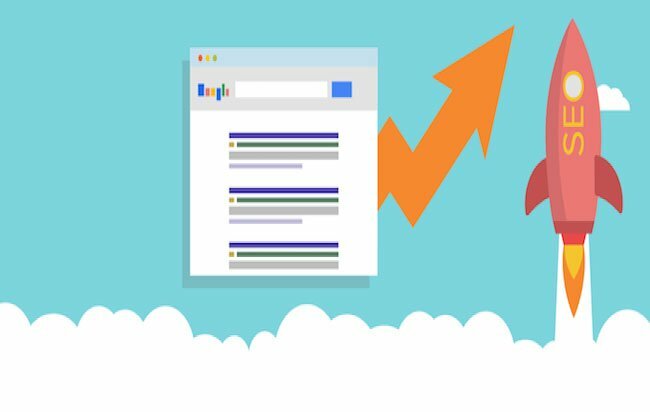 Do you know that Yoast SEO plugin is another SEO plugin which offers great features and easy to use too? 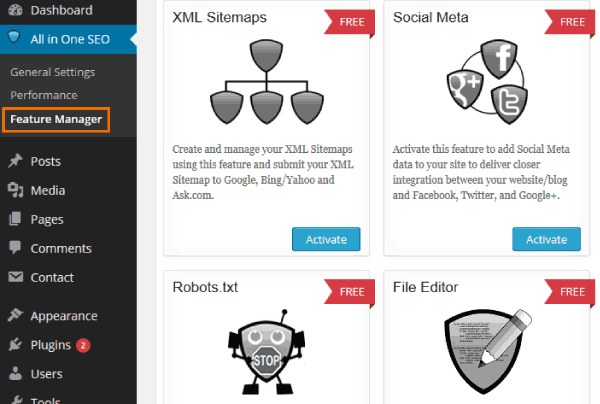 All in One SEO > XML Sitemap is the place where you can do these settings. It is necessary that every website should have a sitemap and it should be added to your Google and Bing webmaster accounts. All in One SEO Pack enable you to add a sitemap to your website and control which pages and post to add to it and which not to. For optimal WordPress SEO Settings, check the Notify Google and Notify Bing options and leave the rest untouched. 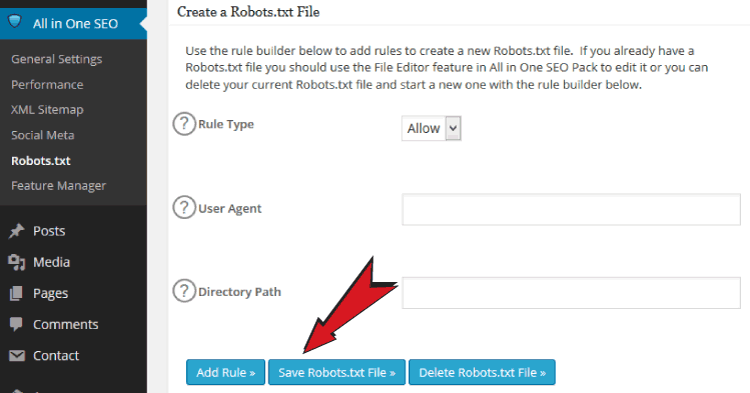 Like Sitemap, each site should have Robots.txt and All in One SEO Pack let you do this easily. To tell more about it, Robots.text gives instruction to web crawlers and other web robots about what to crawl and what not to. For example you can tell Google crawlers to crawl the entire website but tell Bing crawlers not to crawl certain pages and directories. Go to All in One SEO > Robots.txt area, and click the Save Robots.txt File button. This will create this file with default settings. The default setting let everything in your site to be index and is the optimal for most of the websites. Hope you like this tutorial. You are now ready to use All in One SEO Pack Plugin in your website and optimize it to get maximum results from search engines. Do comment in the section below and share this Tutorial with your friends in your Facebook and Twitter accounts.